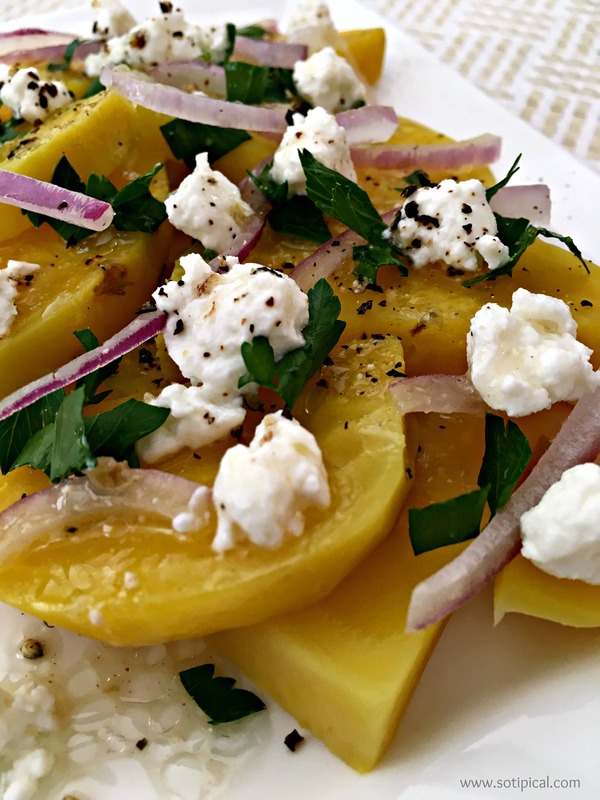 Golden beet salad has quickly become one of my favorite summer dishes! I have enjoyed it both warm, chilled, as a side, as a light lunch, and more! Whether boiled or roasted, golden beets have a wonderful sweet flavor that pairs well with so many other foods. One of my favorite ways to enjoy this salad is with goat cheese, onion, parsley and a yummy vinaigrette. 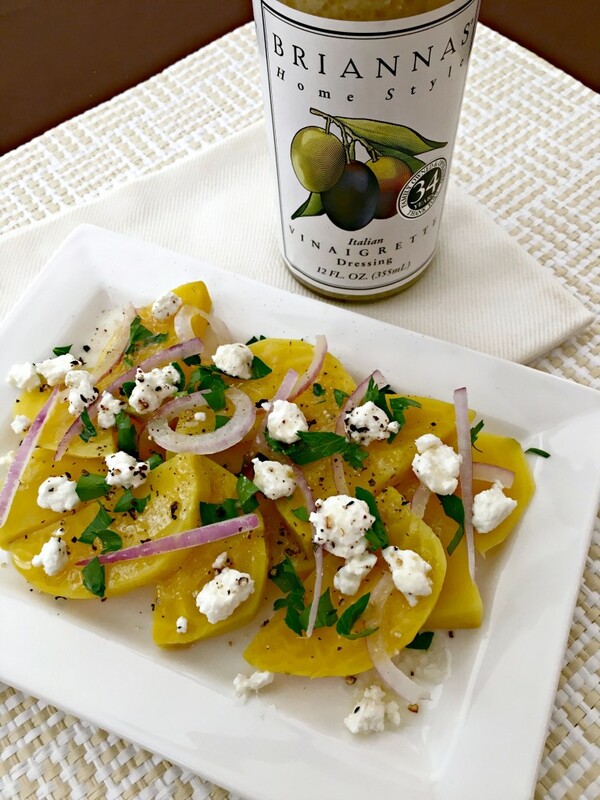 I recently had the opportunity to try Briannas® Home Style Italian Vinaigrette. I received a bottle in my first subscription box by Degustabox USA. This vinaigrette is a blend of oils, vinegar, chopped olives, Romano cheese, with rosemary and basil to create a flavorful dressing that goes so well on crisp greens, pasta, as a marinade, and even golden beet salad! Degustabox is a surprise subscription food box company based in Barcelona, with a presence in Spain, Italy, France, Germany, and the UK. 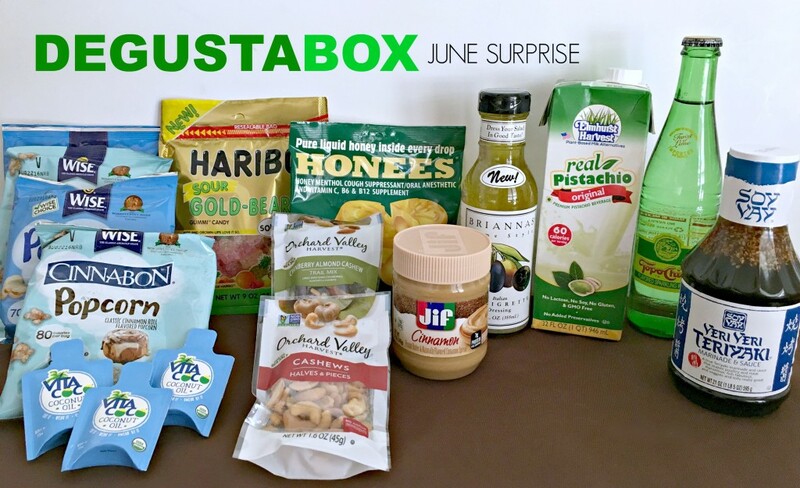 Degustabox USA has recently launched their US operation and thousands are signing up each month! For $19.99/mo, you receive 10-15 yummy food products, many being new to market. If you sign up now, you can get 50% off your first box! Use code DEGUSTA10 to get your first box for only $9.99 HERE. This is what I received in my first box, along with some money saving coupons! I am really loving the small packets of Vita Coco coconut oil! I use coconut oil all the time and these are great for travel! I will be bringing those on vacation! The Wise Popcorn also made perfect lunchbox snacks! 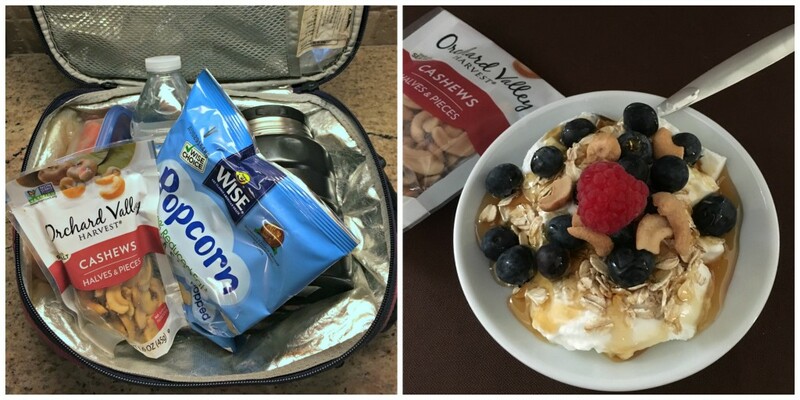 I used the Orchard Valley Cashews in the lunchbox and for a yummy breakfast treat! I have a handful of recipes that I created using items from my June box, which include a dessert, a burger, a chicken dish and a smoothie! Keep an eye out in the next week for more! 6-8 Golden Beets, peeled & sliced. Begin by peeling and slicing the beets. Try to slice them evenly for faster, more even cooking. 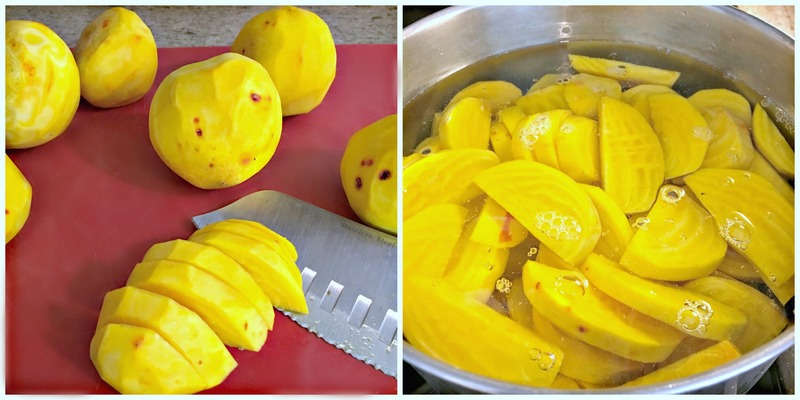 Boil them in a large pot of water, over medium heat, stirring occasionally. Cook for approximately 15 minutes, or until fork tender. Do not overcook. Drain and rinse with cool water. Allow beets to cool at least half an hour or more. You can also chill them in the fridge. Arrange slices on a platter, then top with red onion slices, goat cheese crumbles and parsley. Drizzled Briannas® Italian Dressing over the top and serve! I love to eat this salad on its own or even add it to a plain green salad. This is perfect for a hot summer day and travels well. Refrigerate unused portion. I have yet to try golden beets but the flavors in this salad sound good and I love that bright golden color for a summer dish! I’m looking forward to getting my first box in June!